I have to admit, the Nikon 1 is a cool little camera. Nikon is offering two versions of tiny mirrorless camera(J1 for $649 & V1 for $899), along with 4 lens (10mm f/2.8, 10-30mm f/3.5-5.6, 30-110mm f/3.5-5.6 and 10-100mm f/4.5-5.6). 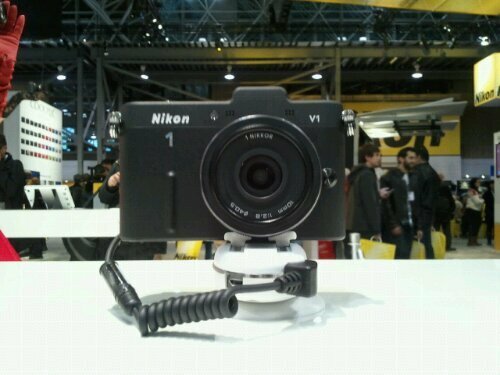 Nikon also introduced dedicated accessories like a Speedlite, Stereo Mic and GPS. The J1 is even available in pink, as well as black, white and silver. Both Nikon 1 cameras have a 3-inch LCD and produce 10 megapixel images from a crop CMOS sensor and a 2.7x crop-factor. The ISO ranges from 100 to 3200 (with 6400 as an option). Nikon claims the Nikon 1 can shoot at 10 fps. The cameras can also record video at 1080p30 fps or 1080i60 fps. Both Nikon 1’s J1 and V1 are comparable in size to the Olympus Pen and Panasonic Lumix lines (leaders in the Four-Thirds format). However, the Nikon 1 mount is not compatible with the lenses from the other Four-Third manufacturers. The hot Sony NEX-5 is a similar body size; however, it uses a much bigger APS-C sensor just like most popular DSLRs.